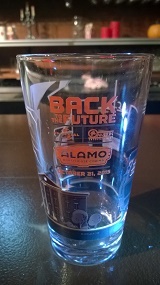 Sunday, January 25th, the Alamo Draft House at Mason Park sponsored a Back To The Future Marathon (all three BTTF movies were screened). In keeping with our mutually beneficial alliance, our club was asked to attend, with the usual perks. The movies were a sold-out show. All photos by Shannon Birdwell (click images to enlarge). A view of the ticket window. 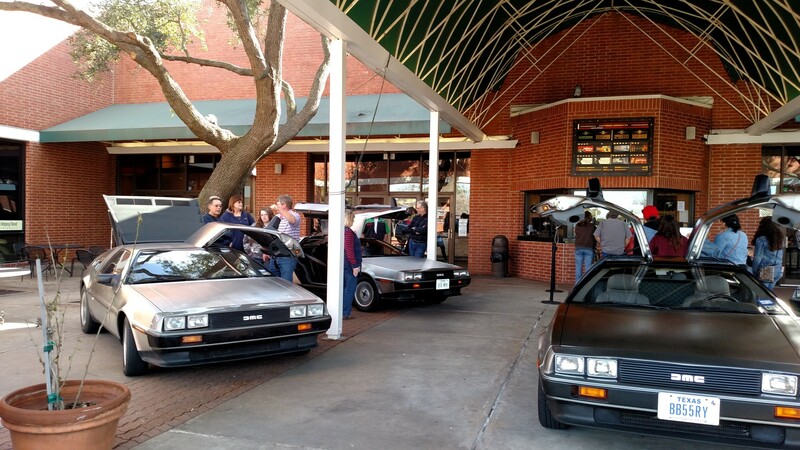 Movie goers were flanked by DeLoreans galore. 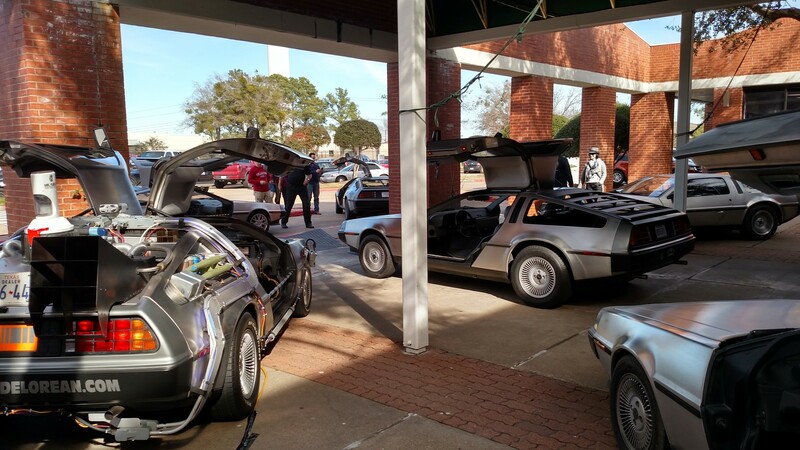 There were eight club cars that attended. The new DMC Texas Time Machine performed its maiden public display flawlessly. At some point, James Espey was heard saying something to the effect of I wish I could go back in time, so I can read the instructions, to figure out how to operate this Time Machine, so I can go back in time. 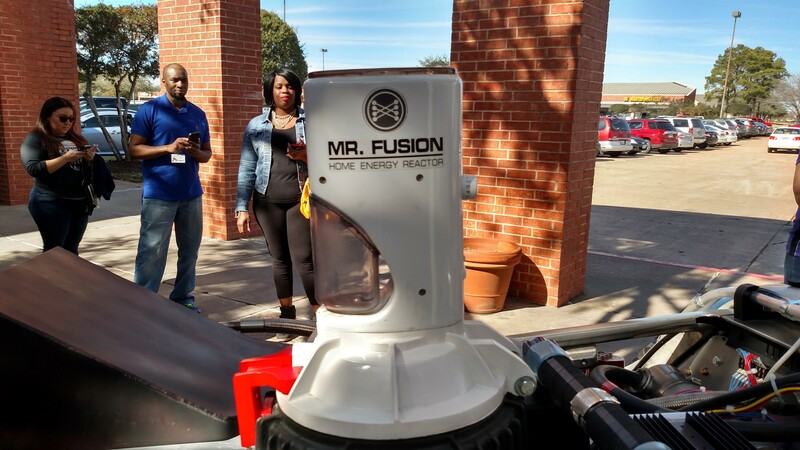 Some movie goers who were not very BTTF savvy thought they could get a free cup-o-coffee from the Mr. Fusion on the Time Machine. For Independence Day, the Alamo Drafthouse Cinema as Mason Park screened a showing of Back to the Future, and invited us out again. Unfortunately, the notification came VERY LATE, and most could not attend. Dennis Urich was able to swing it, and thereby saved our reputation for always helping out the Drafthouse when screening BTTF movies. Photos by Dennis Urech (click images to enlarge). 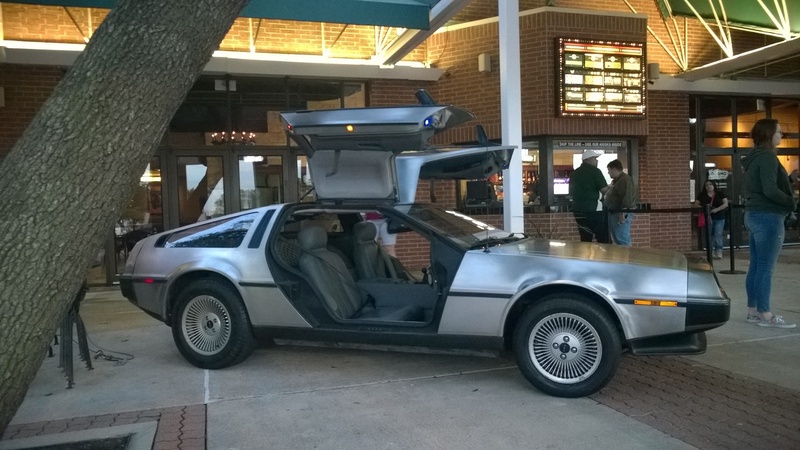 Dennis' lone car at the Drafthouse. 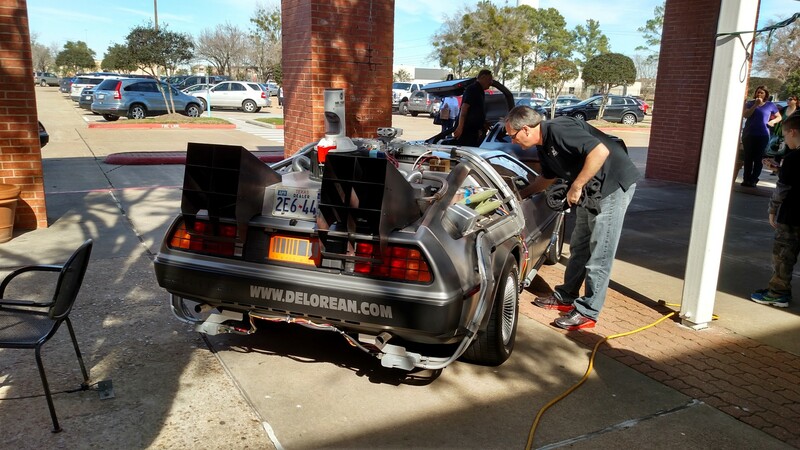 That's a great looking car you have there, Dennis! 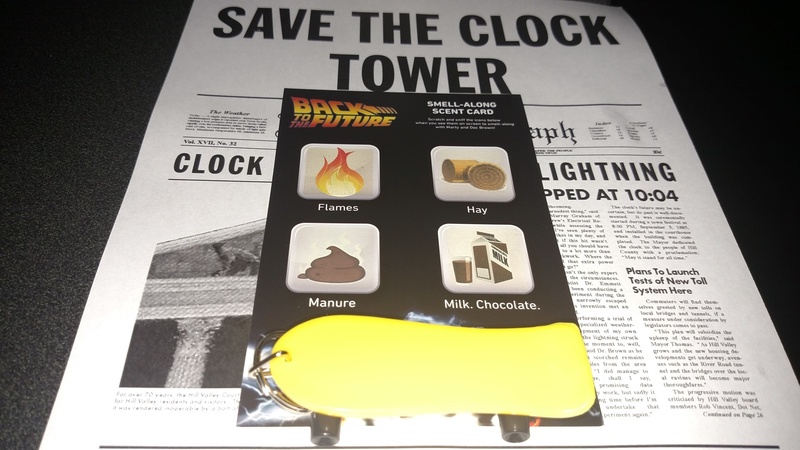 As everyone knows, October 21, 2015 is the day that Doc and Marty landed in, when they used the time machine to go into the Future. 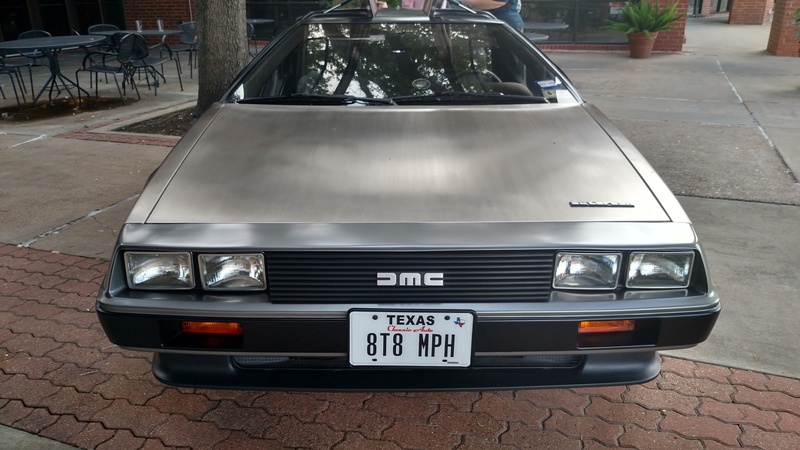 Over the years, Alamo Drafthouse Cinema-Houston has been a friend to the local DeLorean club by inviting us out to display cars at both their Mason Park and Vintage Park locations. And as in the past, we were treated as honored guests, with a complimentary movie pass and meal. We wish to thank Alex and his staff for their great hospitality, and we are glad to help make the showing a success. We had a great time. Thomas' car, under a shade tree in front of the Drafthouse. Dennis' car was the first to arrive, and thus got pole position. 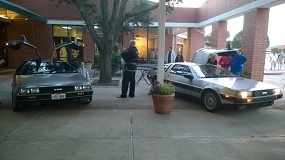 Five of the club cars made the showing, Thomas Kidd, Dennis Urech, Lareo and Melany Garcia, Chip Story and Shannon Birdwell. 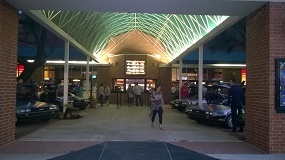 Four cars in the approach to the box office (Shannon's car not pictured). Part of the BTTF promotion had Doc Brown present at the entrance to the theater. He was giving away free, micro hover-boards. Also, BTTF movie goers and the DeLorean club members received a commemorative BTTF glass.